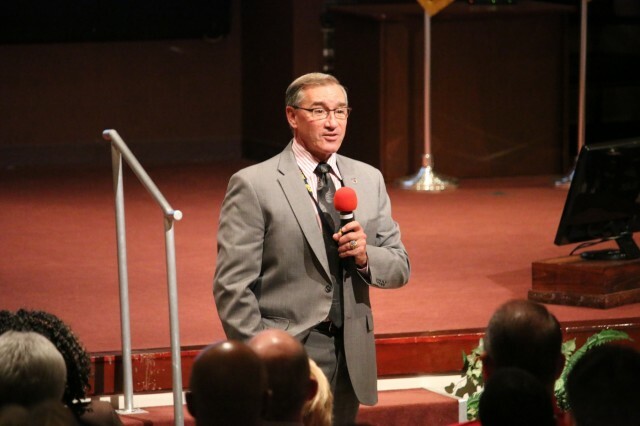 During an Aviation and Missile Command Town Hall on Dec. 11, employees were provided with insight into the commanding general's priorities and intent. "The past year, we have shown significant progress in the areas of enabling the Army to fight and win through supply availability," AMCOM commander Maj. Gen Doug Gabram said. "I appreciate all the hard work that each of you accomplished in preparing the Army to 'fight tonight.' Many of you are involved - Contracting; AMCOM Logistics Center; Test, Measurement and Diagnostics Equipment Activity. Everybody is working these issues. We can't work them fast enough, quite frankly." It is particularly important to ensure Soldiers have the parts they need to keep the Army's aviation and missile systems ready for the fight, he said. "We are working to build depth on our shelves. That can be difficult because of contracting and forecasting issues," Gabram said. "We are also doing well with our outputs at the depots as we perform to promise and forecast for future needs." AMCOM constantly prepares the Army's aviators and air defenders as the nation moves into a more critical and unknown future. For that reason, AMCOM works to be proactive in its role, hosting a series of knowledge-building sessions for Army aviators and air defenders known as AMCOM 101. "The purpose of AMCOM 101 is to enable warfighters to prepare for combat operations," Gabram said. "We must honor the sacred trust we have with warfighters to ensure they have the equipment they need to be successful." To that end, Gabram introduced employees to the AMCOM Campaign Plan, which shows it's operational role in Army readiness of aviation and missile systems; provides guidance for AMCOM for the next two years; nests AMCOM's lines of effort with Army priorities; and enables AMCOM directors and supervisors to tie resourcing, employee appraisals and individual development plans to AMCOM priorities. Gabram stressed that AMCOM must ensure it has developed an organizational trust both among its employees and with the nation's warfighters. Gabram also told employees that the Army Materiel Command's Gen. Gus Perna has been briefed on the AMCOM Campaign Plan and on programs during each of five quarterly reports that have occurred since mid-2016. 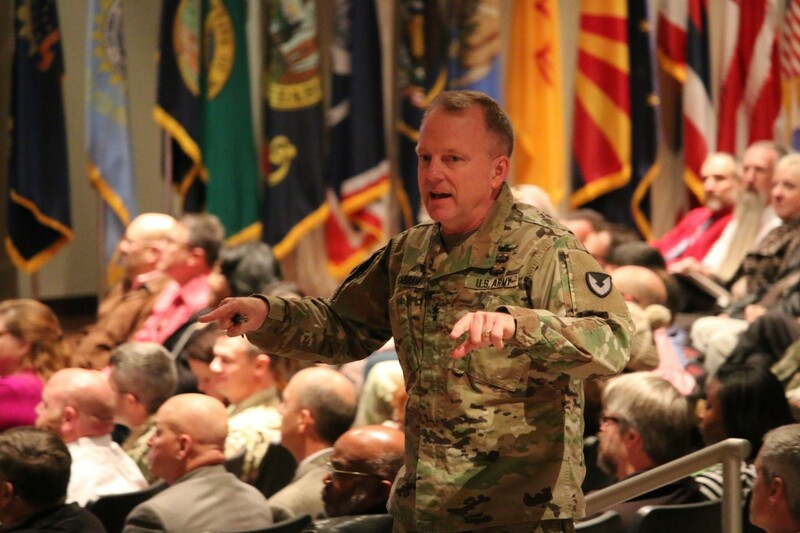 To further emphasize trust, the AMCOM commander also took the opportunity to share with the workforce a chart recently briefed by the Vice Chief of Staff of the Army, Gen. James McConville. Gabram highlighted that the military is ranked highest in terms of being trusted by the American people, but the Army still has areas where it can continue to improve. Gabram encouraged employees to build trust by treating each other with dignity and respect. "Do you have trust in our section? Do you have trust in your leadership?" Gabram asked. Reviewing a nationwide 2016 survey that showed public trust in the military as high and trust in the news media, business leaders and elected officials as low, Gabram said the issue of sexual harassment/sexual assault threatens the public's trust in the military. "Our nation has a great amount of trust in what we do," Gabram said. "Sexual harassment and sexual assault break down the trust and when we lose the trust, we lose it all. "How many units were combat affected by those assaults? This is affecting our Army, our institutions. This is destroying lives. This issue can affect the trust and cohesion in your section. We have to take a hard look at this and make corrections. We cannot tolerate this anywhere in our Army because it tears down trust, tears down cohesion. We don't want this to happen to our wives, to our daughters. This is a national crisis, not just an Army issue." Overall, command climate surveys give leadership an idea of how much trust employees have in their organization and its supervisors. "What happens in your office, that's important. If you set the example and treat people with dignity and respect, we won't have any problems," he said. The workforce update included comments by the deputy to the commanding general, Bil Marriott, who discussed AMCOM's progress with employee performance plans and the impact continuing resolutions on AMCOM programs. Steve Fisher, AMCOM's secretary to the general staff, reviewed the Combined Federal Campaign and the new online giving procedures. The Tennessee Valley community is the largest contributing geographical area for CFC. This year's campaign ends Jan. 12, 2018. Gabram presented Birvid Atkins-Warner of the AMCOM Logistics Center an Achievement Medal for Civilian Service for her work as a program analyst with the Policy and Operations Division of AMCOM Resource Management (G-8) from October 2016 to March 2017. Atkins-Warner demonstrated outstanding leadership and technical ability in the management of AMCOM's Management Internal Control Program, achieving a 99 percent security training completion score and implementing the 2017 annual statement of assurance. The following employees received length of service awards: 40 years - Lena Godfrey, Internal Review & Audit; and 30 years - Julie Foreman, Thomas Barnett Jr., William Gass, Ann Kissell, Kevin Kennedy, Christopher Lofts and Robert King, all of the Aviation and Missile Command Research, Development and Engineering Center.